The Pitter Patter Diaries: Do We Need to Keep Christ in Christmas...? 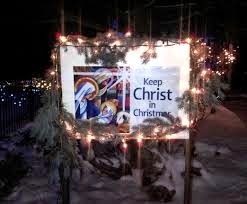 Do We Need to Keep Christ in Christmas...? I see the signs floating around this time of year. Some find their way to a church lawn, others find their way onto a bumper or window. "Keep Christ in Christmas," they say. I understand the sentimentality. I do, I really do. In a world where Christmas merchandise is available along with our Halloween decorations, all roughly thirty seconds after the back-to-school sales have ended, I understand. In a world where Santa is busily Ho-Ho-Ho-ing you to buy more, do more, be more this Christmas, I understand why we could be drawn to the sentiment. If you'll forgive me, though, I must argue that it is a misguided sentiment. It may even err on the side of a narcissistic fantasy that we determine whether Christ is or isn't in any THING. Christ, the Lord of all, Savior, Redeemer, Son of God and Son of Man, hardly needs us to keep Him in anything or any season. Christ was, is, and always shall be the core of Christmas. The Mass of Christ. It belongs to Him. On the converse, where are our hearts? Are we showing up for Christmas? Are we allowing Christ to be our focus in this season, and truly, always? Are we allowing the incarnation of Christ, who was, is, and ever shall be to reign in our hearts every day, every minute, every breath, every second? Are we pouring ourselves out for our neighbors? Are we taking up our cross to follow Him? Are we allowing ourselves to die to selfishness and growing in virtue? Do we look at our neighbor as the "other" or do we see the image of God in them? Perhaps Christ would remain more visibly in Christmas if He were more visible in us every day of the year. I know there is whole heaping load of room for me to lose my self-focus and empty myself to make that more possible. Christ was, is, and always will be the heart of Christmas. The real question is, are we with Him? Wishing you and yours a most joyous Christmas. May the love of God be poured out into your hearts to overflow, so that when the world now sees you, they see Him. Have a happy Christmas, Rakhi!